The University of Scranton’s football team may no longer be around (in fact, it’s famous on campus for being “undefeated since 1960”), but at the Weinberg Memorial Library, UofS football is back in a big way. This week, the Library is proud to announce the University of Scranton Football Collection, a digitized version of our football archives. The collection includes over a thousand photographs of University of Scranton (and St. Thomas College) football teams, players, coaches, and games – as well as photos of the cheerleaders and marching bands who cheered them on. The collection also features a set of football game programs. The programs, produced for each home game, have team rosters, statistics, and game analysis. Most of the materials come from the years 1900 through 1960, when the varsity football team was disbanded. This collection isn’t just for UofS football fans, though. The game programs in particular are a rich resource for researchers interested in the history of Scranton and its surrounding area. The programs were sponsored by local businesses (like the Hotel Casey), so the booklets serve as miniature “time capsules” showing slices of Scranton life over time. 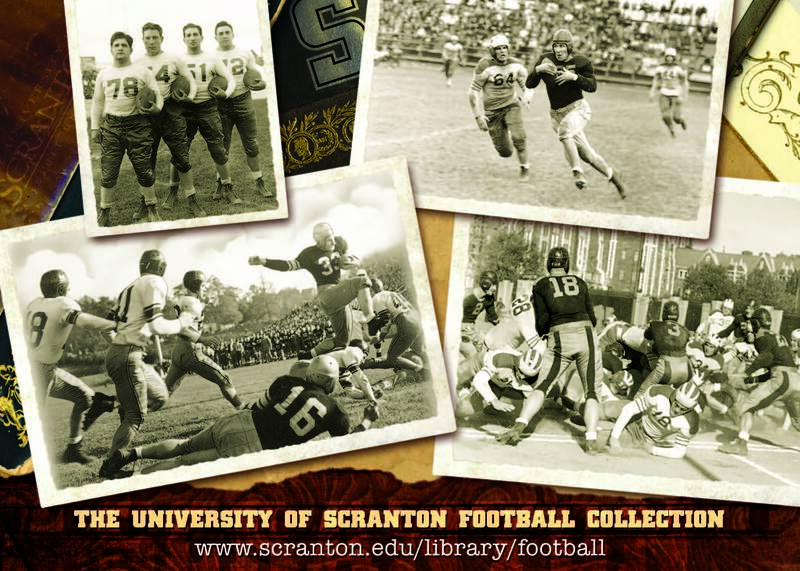 We invite all students, staff, alumni, and community members to browse and search the collection at www.scranton.edu/library/football. You may also want to take a look at our brief history of University of Scranton football. P.S. While we have identified many of the photographs, some are still mysteries. If you recognize a player, please let us know! Many thanks to librarian Kay Lopez, library systems specialist Jennifer Maher, and digital services assistant Kevin Pheasey, who all dedicated many hours of hard work to this project. Need Journal Articles from 1865? Comments Off on Need Journal Articles from 1865? Then JSTOR is a database you want to try. Select JSTOR on our A-Z List of Databases. Then, type your search topic into the Advanced Search field at the top of the page. Keep in mind that your topic may have been called by a different name back in the 1800s! Then click “Search,” look for article titles that cover what you need, click into them to read the abstracts (summaries) as needed, and select the .PDF option for viewing, printing and saving the articles for your research. Remember, if you’re working from home or your dorm, make sure you first sign into My.Scranton.edu, and then select “A-Z Database Listing” from inside the Library tab. This way, when you eventually get to JSTOR, the database will recognize you as a student, and it will let you access the full-text .PDF of the articles you need. Ever wonder what was being written about, say, librarians, in the late 1800s-early 1900s? Go give the search a try to find out! * There is one very interesting article from 1929 about a study of ways that librarians cultivated “wholesome reading interests” back then (“Methods Employed to Stimulate Interests in Reading. I” by William F. Rasche, from The School Review, Vol. 37, No. 1 (Jan., 1929), pp. 29-36) — very interesting indeed. *So, okay, I know most of you probably don’t care about librarians and our fascinating history as public figures in the community… Ahem. But! Whatever your research interest is (for instance, I know there’s an assignment going around about researching the same social issue in 3 different historical time periods) JSTOR is a great place to start in your search for old journal articles on the topic.